30 Day Free Trial – PRIME PANTRY! Affiliate disclosure: Sweet Humble Home is a participant in Amazon's affiliate program and will earn a small advertising fee if you click on products mentioned in this post and purchase. This is no extra cost to readers. I love an easy side dish, and one that is impressive at the same time so you can keep it in your regular rotation as well as serve to guests is a winner in my book! 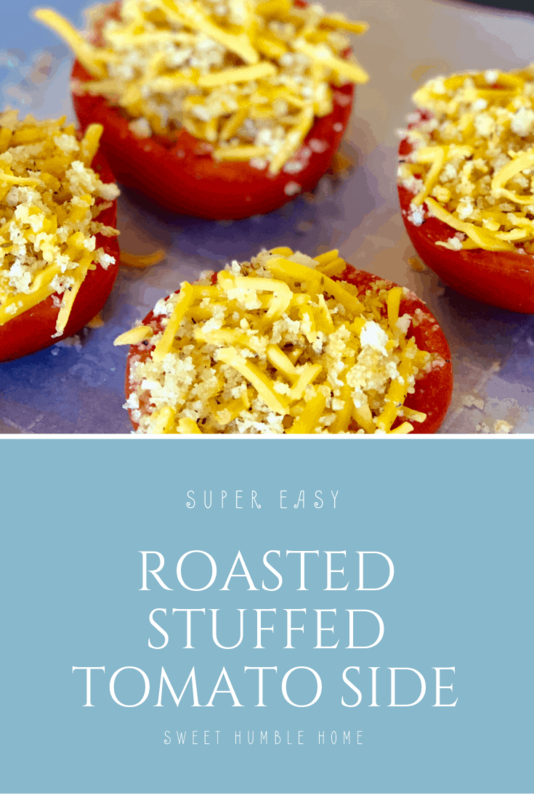 This recipe for an easy roasted stuffed tomato side is so simple that you may put your kids in charge of making it! Cut your medium tomatoes in half and hollow out with a spoon. Mix together 1 cup of panko breadcrumbs, 1 tsp salt, 1.5 tsp Italian seasoning, 1/2 tsp pepper, and 1/2 cup of shredded cheddar cheese. 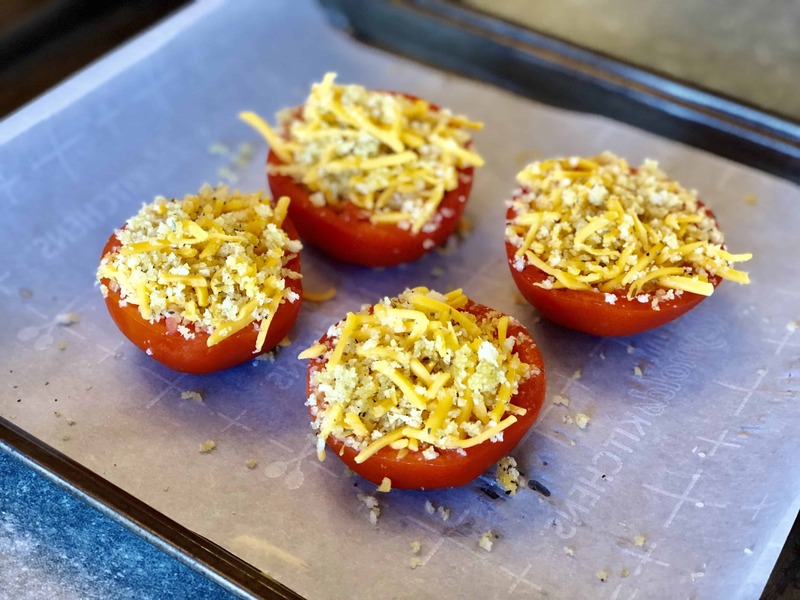 Fill the tomatoes with the mixture evenly into each tomato, and place on a parchment lined baking sheet. Bake at 350 degrees for 20 minutes. 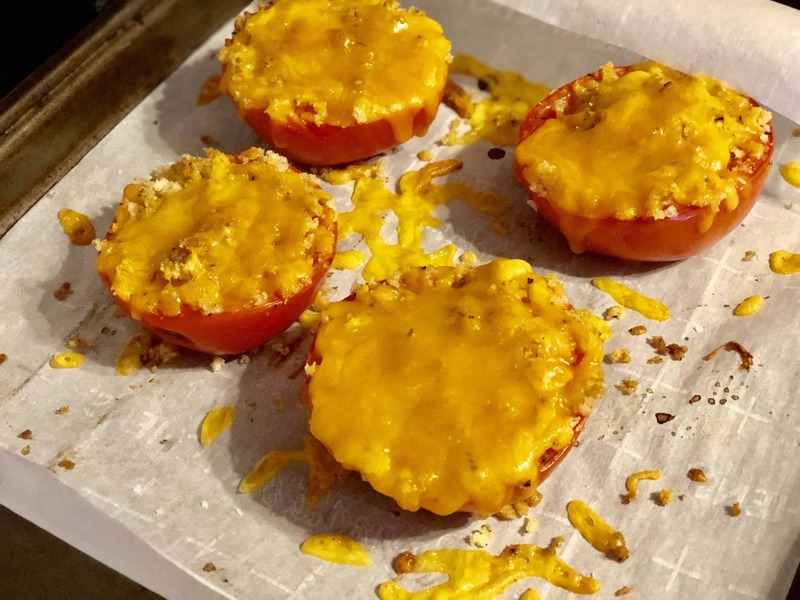 At 20 minutes take the tomatoes out and sprinkle a tablespoon more of shredded cheese on each tomato. Bake for 5 minutes longer and enjoy! The last time I made them I served them with a ribeye (my husband makes the best steak), and red onion that I simply sautéed in a little olive oil and butter. Let me know if you try this – and let the kids help you! Sweet Humble home is a participant in the Amazon Services LLC Associates Program, an affiliate advertising program designed to provide a means for sites to earn advertising fees by advertising and linking to Amazon.com. Copyright: © 2015-2019, Sweet Humble Home and SweetHumbleHome.com. I’m glad you’re here! If you would like to share my content, I'd love to hear from you. Please contact me via the email on my contact me info. Please remember to provide full and clear credit to SweetHumbleHome.com with a link back to the original content. My images should not be adjusted in any way. Please also feel free to pin my content to Pinterest!